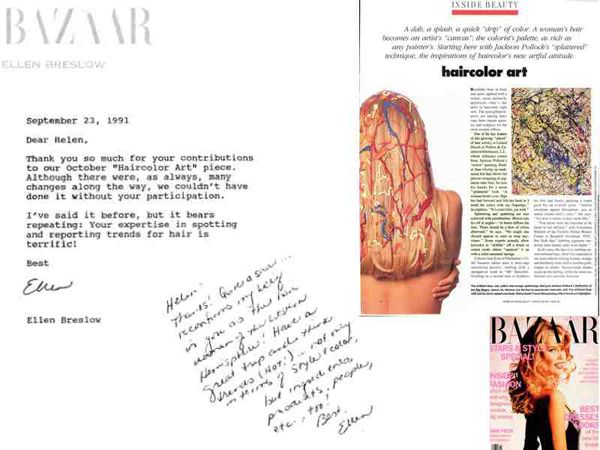 As Leland Hirsch prepares to launch “a secret new visionary hair product in 2016,” I am reminded of the Jackson Pollock-inspired “Haircolor Art” Piece in the the October issue of Bazaar in 1991. They assigned me to cover HairColor USA in Miami, he was co-founder. It was July. Steaming hot. Outside. In the basement of the famous Fountainbleau Hotel, where the event took place for 2 or 3 days, it was freezing cold. I came back with a cold and soaring temperature, and wrote the piece hardly able to sit up. As you can see from the Bazaar Thank You letter to the left, there were changes and my full coverage was not used. However, it turned out well for the visionary haircolorist, then co-owner of NuBest Salon, and the man behind the brilliant ARTec products, later sold to L’Oréal.